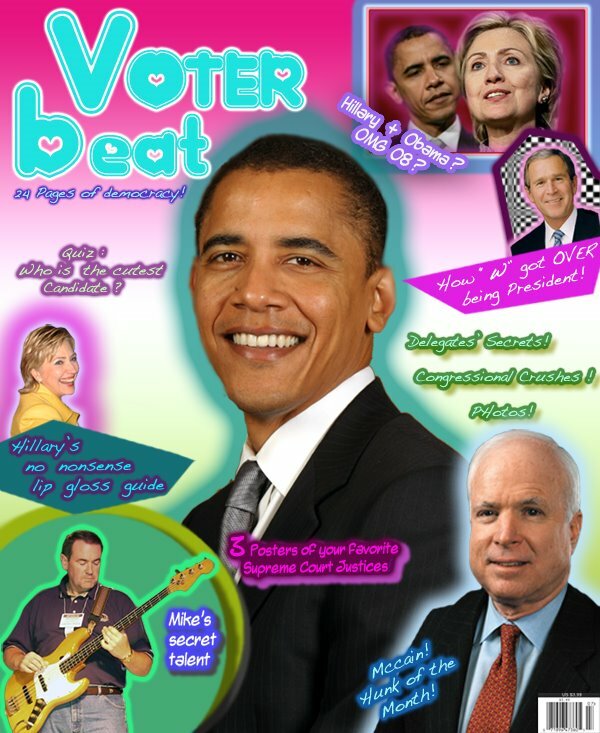 FunBox Blog: OMG LOL Hillary + Obama '08? Shhhh! Can you keep a secret? Mike Huckabee can’t! He couldn’t wait to spill ALL of his love secrets to Voter Beat! Does Mike believe in love at first sight? What does he look for in a crush? Does his wife approve of his girlfriends? He answers all these burning questions and more in this month’s issue, and he's also signed a tank top for one lucky reader! Can you say Oh My(ike) Huckabee? How bout more cool prizes? Hillary Clinton signed a program from her Augsburg College debate with Barack Obama! Plus, I know you’ve definitely dreamed of being a superdelegate right? Well, then you’ll definitely want to enter our “Be a Superdelegate for a Day,” contest. One lucky reader will get to go to the national party convention of their choice and get the star treatment before they cast their vote for America’s future. Get all the deets on how to win in the magazine! It’s no secret that Barack Obama is probably the most famous 40-something in Washington D.C. How does he stay grounded? How does he make time for his friends. Does he have any pets? These questions and more answered inside!